Leaves Landsborough 8.00am & CFHRI Library 8.15am. Registration closes Saturday 2nd February. If you cannot get to the library to register please phone Roz. 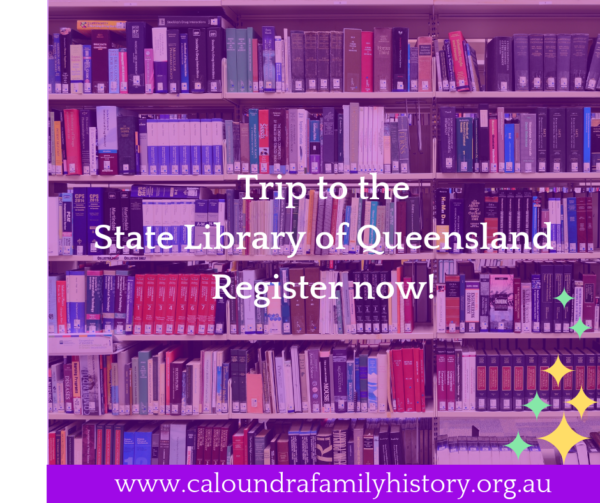 Organise or renew your State Library membership online before the trip. * Note: Bus cost to be confirmed. If there is insufficient attendees we will car pool and leave from the CFHRI Library at 8.15am. View other Trip Special Events or Training Special Events coming up.